Okay, so maybe I’m a sandbagger, but only because they don’t let the 30 year olds race the 40 year olds! Those women are fast! Although I became World Champion (muahahaha) in the 15km free for 30-35 year olds, former US Olympian Laura Mccabe blew us all away with a time of 41.12 (21.85 km/hr). The tightest race was in the 45-50 crew with Leslie Hall taking the win in 42.26 and 5 other women chasing her in in times faster than mine….ohhh how I wish we could have all started together! My start was hilarious. We start double poling in tracks and I felt amazing, leaping off the ground and really moving…that is until I lost my balance and fell on my but before we even cleared the tracks! Oh the shame! From there on it was chase mode. I thought the Italian racer was going to be the one to beat (having FIS points and all), but instead there was a tall powerful woman, a Canadian, leading the charge. Familiar with chasing the start I went into overdrive to catch the leaders. I was successful and then took a while to watch Marta ski so powerfully, wondering if I would be able to get away from her. Unfortunately I don’t have her grace on skis, but I do have an engine, so I put it to use and moved into the lead. The conditions and course were fast and lovely with sparkling snow falling in sunshine. I have to say that the masters ski crew has to be the friendliest group of people out there. It was so much fun hanging out and getting to know everyone. 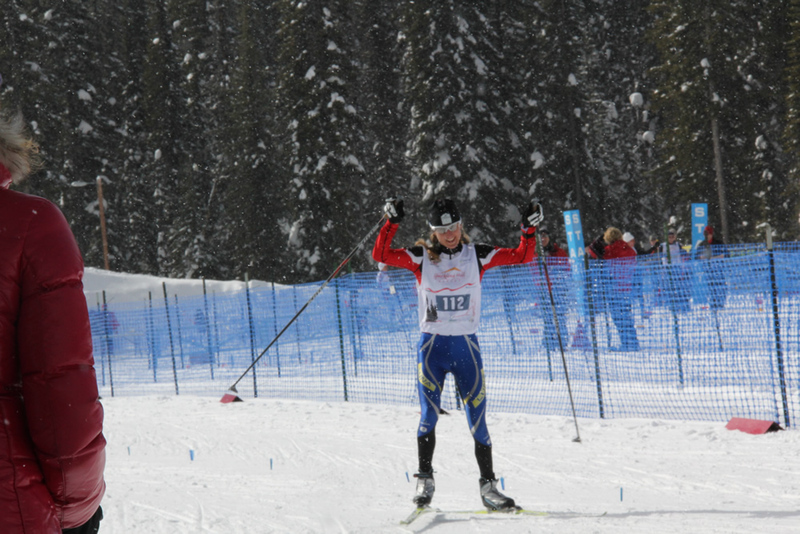 There were definitely some familiar faces out there, and not only our awesome Kamloops crew. Mitch Bailey’s (mtb) parents raced with momma Bailey claiming 5th in her category! And although Keith likes to now tout me as the “World Champion of old people”, I can really only fairly claim to be 9th fastest old gal on the day! pancakes for recovery my friend, and well dressed. Oatmeal is still the pre race strong hold. 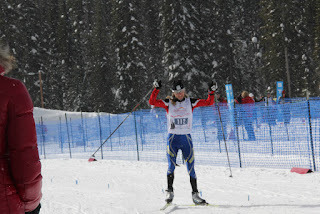 Awesome.adventure ... Watson raced skiis and also suffered in the double pole ... Add that to next years traning ,!! You are amazing Catharine! I love reading about your adventures!